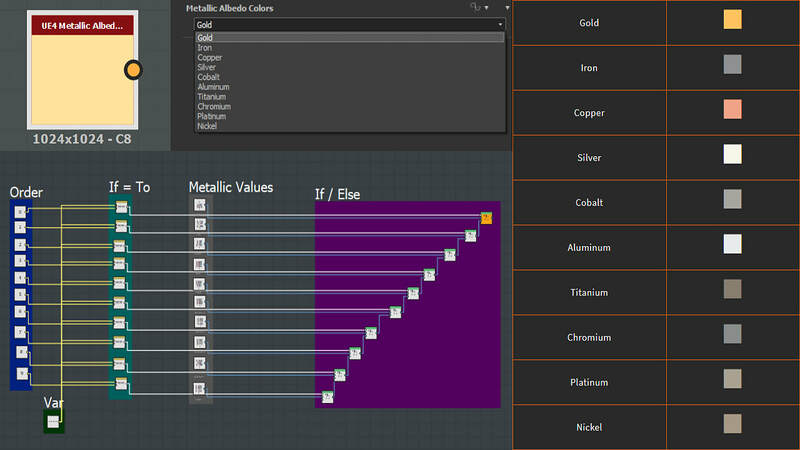 The UE4 PBR Material Options tool was developed in Python/MEL for Maya and selection-based use. 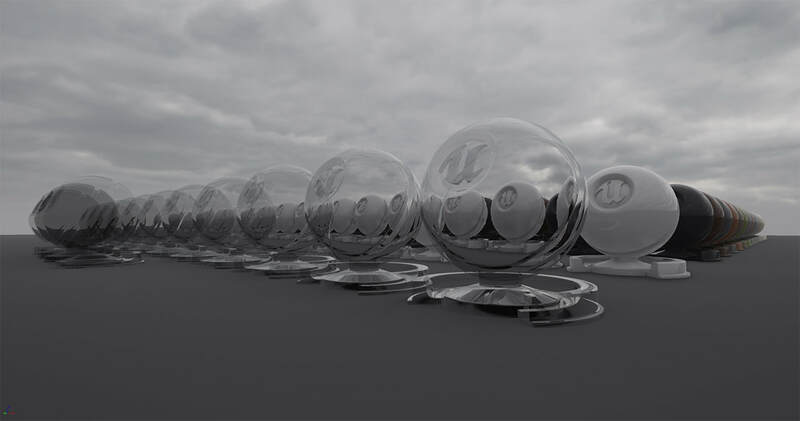 It allows artists to iterate faster on PBR content in Maya for a seamless integration into the UE4 environment. 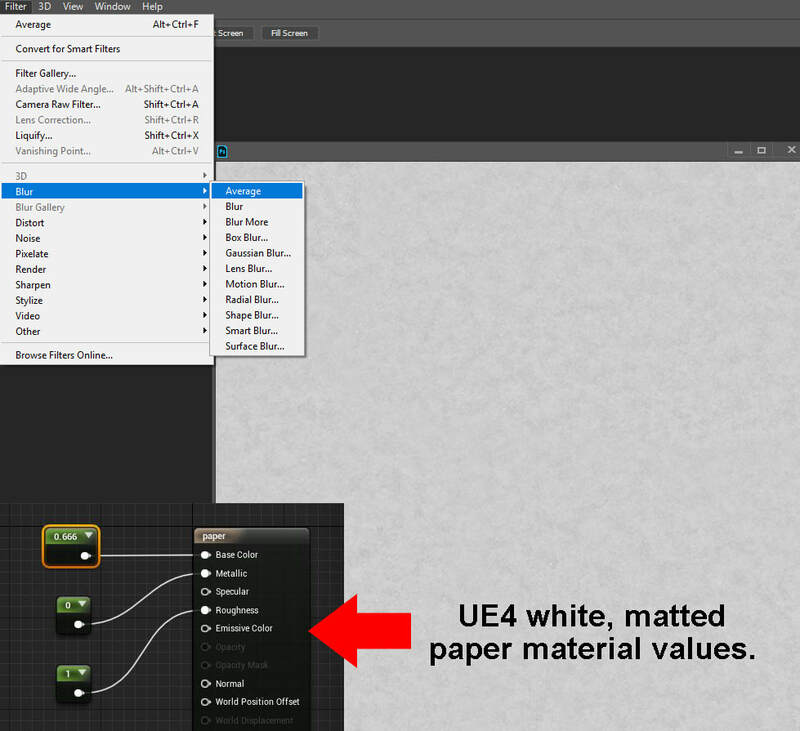 This tool can name/assign/create materials and delete unused ones without needing to open the Hypershade, import textures with a material auto-setup process, live/selection-based texture reloading, export meshes/textures into organized subdirectories for auto-reimporting into UE4, check/notify the user if the tool is being used in unsupported ways, and to calculate lightmap densities based on UE4’s Ideal Density value. 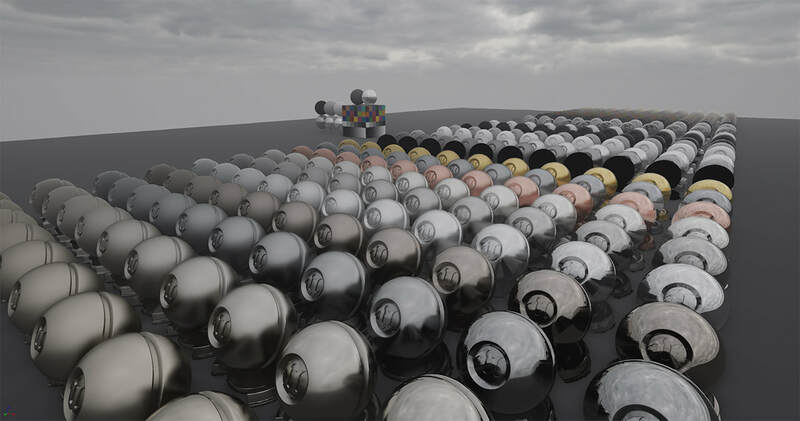 Below is a tech demo and sample Python/MEL code for the UE4 PBR Material Options tool. In addition, you can click and drag the code box's lower right-hand corner to expand it. # Gets the polygonal surface area in cm/world space. # Gets the square root of the surface area to convert it to a squared resolution. # Converts the cm squared resolution to a m squared resolution. 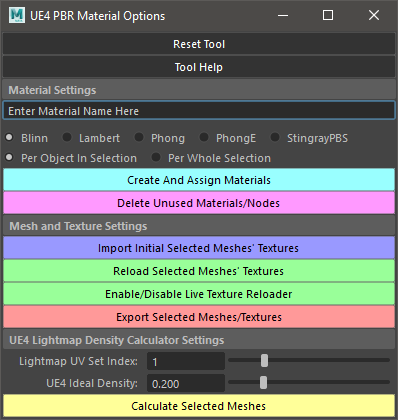 # Gets the UE4 Ideal Lmap Density value for the mesh based off the polygonal surface area. # Gets the names of all the UV sets for the current object. # If the user chooses an UV set index value that's greater than what the current object contains, the object is skipped. The UE4 custom view modes below help artists visually problem-solve different aspects of their materials and lighting. Some of the debug overlays are for out-of-range PBR values, nit/false color heatmaps, Rec.709 broadcast legal levels, AO coloring, and luminance visualizers for base color/focal point control. 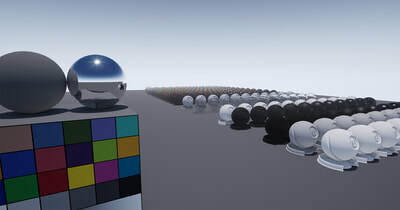 These PBR utility nodes were designed to work within UE4's PBR range. Three of them use physically-based data for dielectric, metallic, and specular presets. 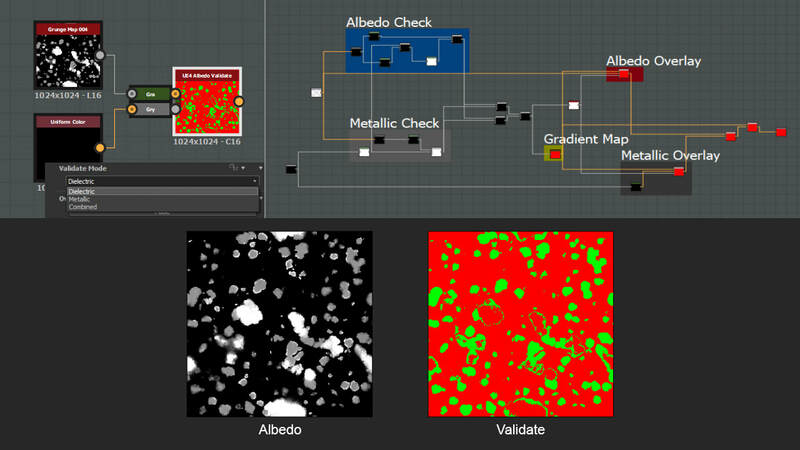 Another validates whether your dielectric/metallic albedo values are within/outside UE4's PBR range, while the final PBR utility node can adjust out-of-range base colors. 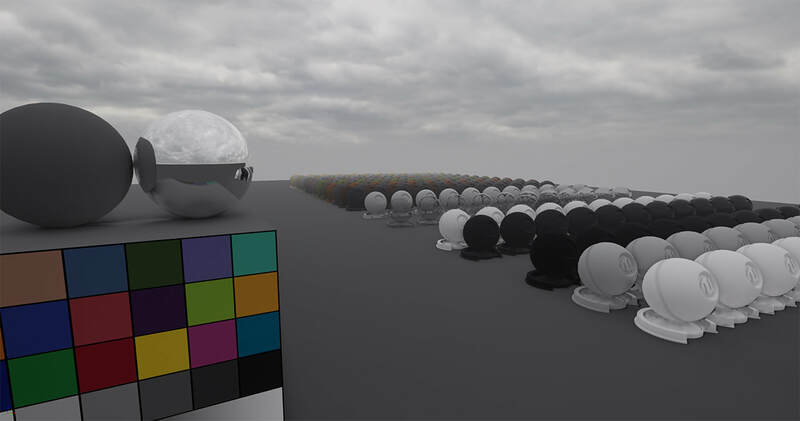 The neutral lighting environment below uses all dynamic effects, like LPVs, DFAO, SSR, SSAO, RTDF, volumetric lighting, Convolution Bloom, bokeh lens flares, utilization of real-world data, etc., for quick material/asset testing without the need to bake lighting. The scene includes varying, physically-approximated TODs, tools, and PBR materials for visual reference. ​Note: This guide assumes the reader has a basic understanding of PBR. Generally, daytime lighting has a ~4:1 sun/sky (direct light vs shade) intensity ratio, sunrise/sunset is ~3:1, and overcast is ~2:1. However, since lighting conditions vary by location, time of day, weather, pollution/atmosphere, season, etc., the values listed below should only be used as a guide. (cd = candela) Light source intensity per square meter. Reflected surface illuminance. Also, 1 lux = 1 lm/m², or a 1 cd light at 1 m = 1 lux. Describes physical light falloff. Also, intensity (cd) ∝ 1/square of the distance. Reflected light is never brighter than its cast light. ​​Supplementary light used to brighten shadows/content and/or to simulate bounce light. 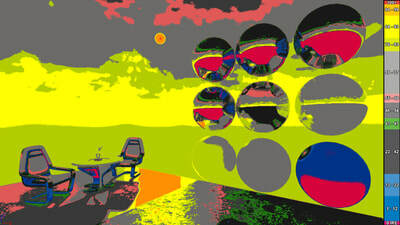 ​Light contouring subjects for background separation, thus implying depth. Light that simulates physical light sources, like a light bulb or window. Support light that doesn't have a physical representation. Horizontal angle of the sun’s position. Vertical angle of the sun’s altitude. ​Color temperature (K) is defined by the temperature of a blackbody emitting light with a particular color. Blackbodies also absorb all light casted onto them. Below are color temperature examples with values listed in sRGB first with corresponding sRGB color swatches. The combination of the aperture, shutter speed, and ISO define the exposure value. Below is an EV100 formula and guide. ​The Sunny 16 Rule, which can be viewed in the chart below, approximates correct daylight exposures without a light meter. The camera's ISO and shutter speed share a reciprocal relationship. Note: This guide assumes the reader has a basic understanding of PBR. ​​• Sun: Uses lux values. You can apply Light Values Guide and Color Temperature Guide data to sun Intensity/Temperature parameters. Note: ​If you’re trying to align the sun’s location to one in a skybox texture, you can use the UE4’s BP_Sky_Sphere to assist you. This can be achieved by either adjusting the sun’s position to match the skybox’s sun or by rotating the skybox itself. 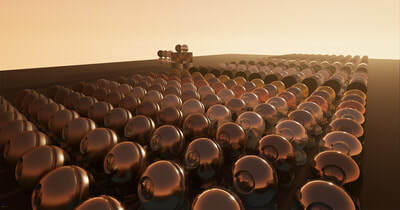 By toggling the visibility of the BP_Sky_Sphere, making sure you have the correct directional light actor assigned to it, and refreshing its material to update its procedural sun texture whenever you make sun rotational changes, can this process then visually help you align the sun to the skybox’s sun. 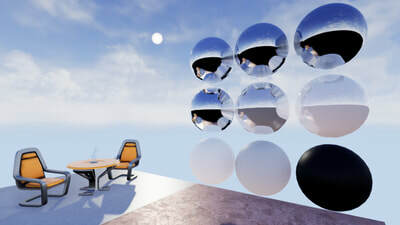 Techniques for skybox setup can be found in either The Matted, White Paper Test or UE4 Cubemap Orientation Guide sections. The Sun Position Calculator renders geographically accurate sun location, date, and time of day. 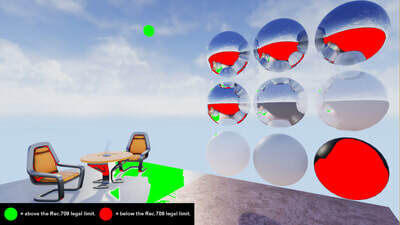 To use the BP_SunPosition, a BP_Sky_Sphere is required to move the sun disk and orient the Directional Light (It also needs to be assigned to the BP_Sky_Sphere. ), which should be set to Moveable for dynamic sun angle change. Additionally, the BP_SunPosition gizmo's (seen below) rotation property should not be modified, as this attribute is driven by its North Offset parameter. Below are BP_SunPosition attributes and their descriptions. Positive values are east of the prime meridian, while negative ones are west of it. 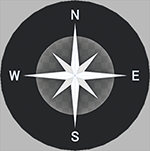 Positive values are north of the equator, while negative ones are south of it. Offsets the hour amount from UCT/GMT. Sets the time of year/day. Options include year, month, day, daylight-saving time, hour, minute, and second. • ​Sky: Uses cd/m²​, or nit, values. 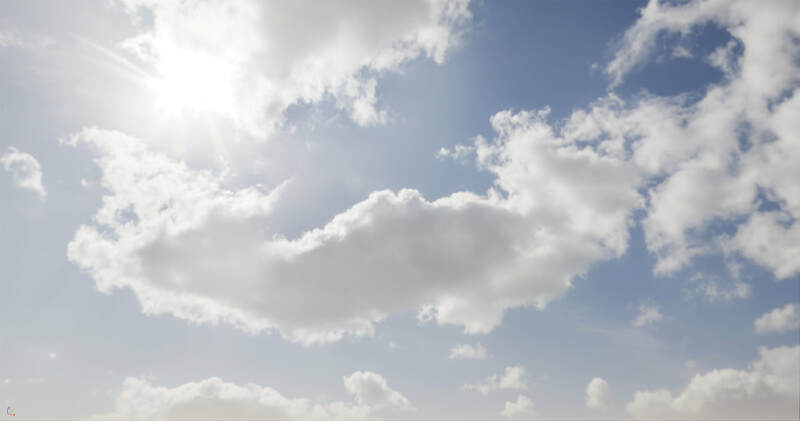 The sky luminance is determined by the HDRI's normalized pixel intensity values multiplied against the Sky Light's Intensity parameter. You can apply Light Values Guide data to sky intensity values. 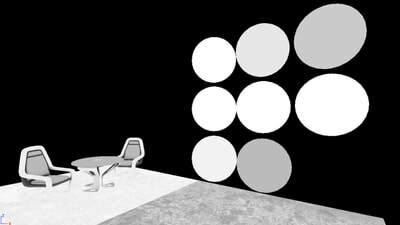 • Spot/Point/Rect Lights: Uses unitless, candela, or lumen values. (The light must have Inverse Squared Falloff enabled to specify the light unit. When disabled, low-intensity fill/helper lights can be used when hot spots near light sources are undesired.) You can apply Light Values Guide and Color Temperature Guide data to lights' Intensity/Temperature parameters. 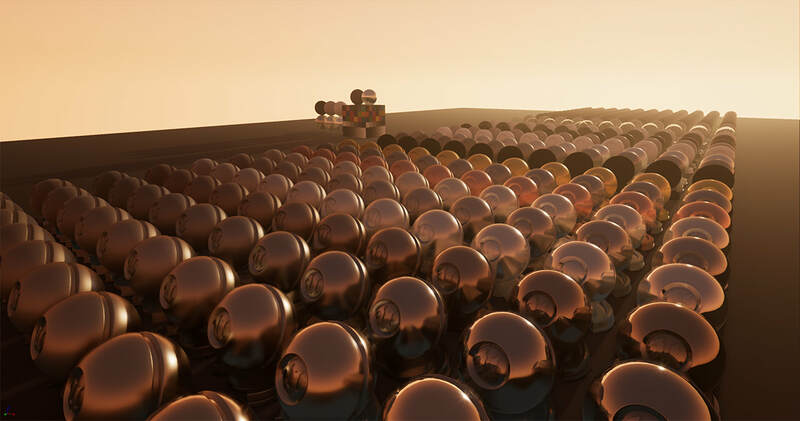 • ​​Emissive materials: Uses cd/m2 for pixel luminance. 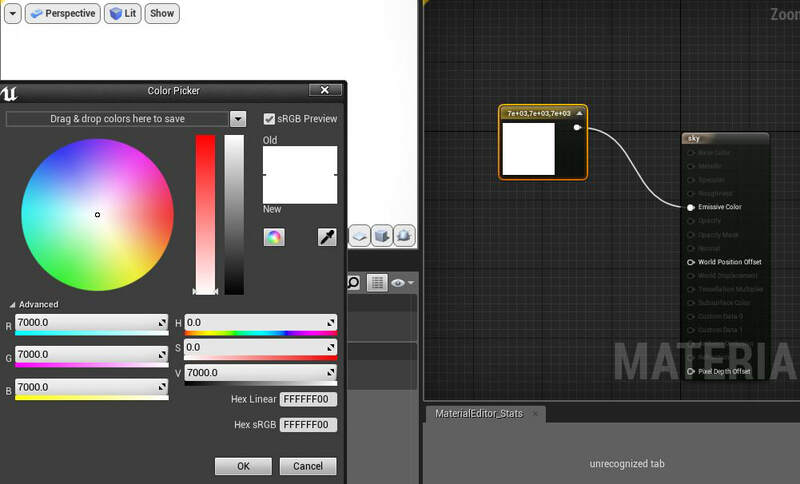 This is utilized by emissive materials (Materials set to Unlit in the Material Editor.) applied to static meshes with their Use Emissive for Static Lighting setting enabled. The Emissive Boost property scales the static light intensity emitted from the emissive material. 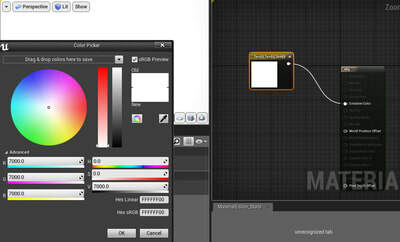 This can also be achieved by multiplying an emissive texture against a value in the Material Editor. You can apply Light Values Guide and Color Temperature Guide data to emissive values. • ​Atmospheric Fog approximates light scattering effects in the atmosphere. 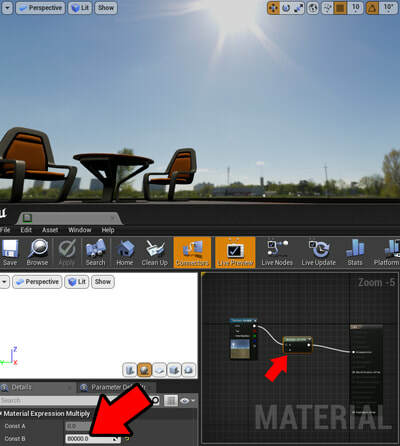 This feature can be used by adding an Exponential Height Fog to your scene and enabling its Volumetric Fog option. You can only have one active fog actor at a time. Also, it’s recommended whenever you are roughing in your scene’s lighting, always start with sun, sky, and fog elements due to their relationship to one another. ​For lights to interact with the volumetric fog, you need to enable/adjust their Volumetric Scatter Intensity and Cast Volumetric Shadow parameters. 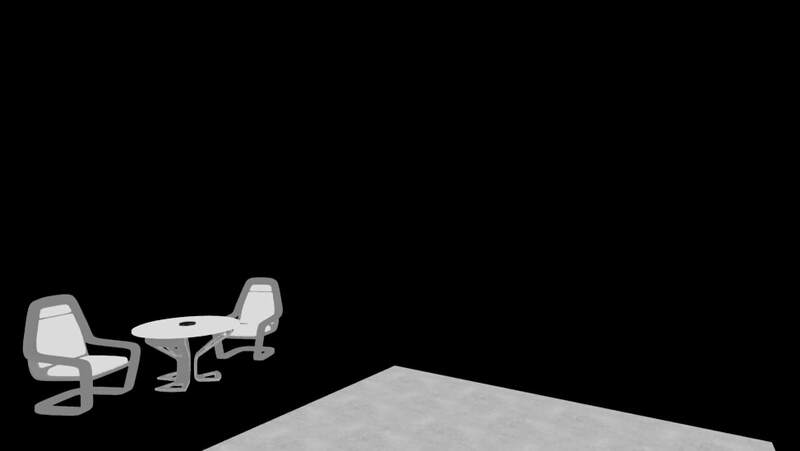 Movable/stationary lights yield higher-resolution results with volumetric fog than static lights/volumetric lightmaps. • An alternative way to set/measure the sky's average luminance in cd/m², or nits, is by sampling sky intensity values from midtone areas via the Pixel Inspector. Since reading individual pixels can vary, it’s best to average large portions of pixel values first for easier sky analysis. This can be achieved by loading the sky texture into the Texture Properties Editor, lowering its resolution or by increasing its mip level, saving it, and then analyzing the lower-resolution sky in the viewport. Techniques for adjusting sky intensity values can be found in The Matted, White Paper Test section. ​Below is an example of an adjusted sky texture’s mip level. The one on the left has a resolution of 4,096 x 2,048 (mip level: 0), and the one on the right has a resolution of 32 x 16. (mip level: 7) It's important to note that each lower mip map level is half the resolution as its previous one. 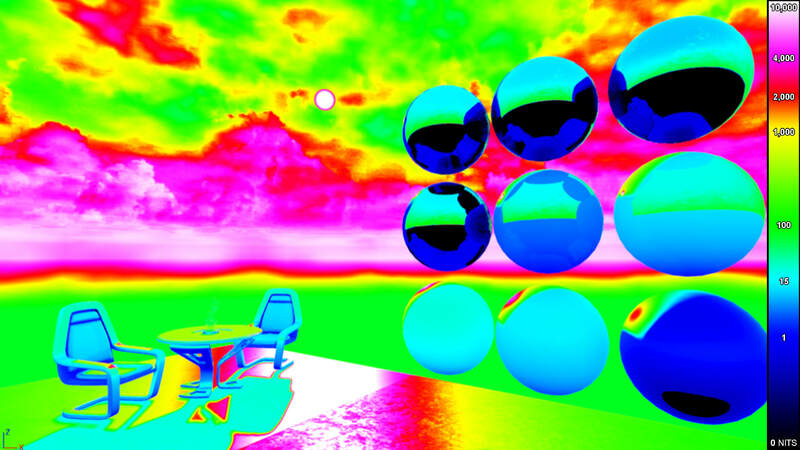 Note: Sky Lights capture scenes in a cubemap format for ambient lighting and reflection contributions. (The lowest mip map level of a cubemap is used for ambient lighting, while the higher levels are for reflections/roughness textures.) You can add color to the lower hemisphere of your environment light by enabling the Lower Hemisphere is Solid Color option and adjusting the Sky Light’s Lower Hemisphere Color parameter. This can be used to simulate the average, reflected ground light/color. You can also leave the color black to only have ambient light cast from the upper hemisphere. (Sky color controls exterior shadow color.) 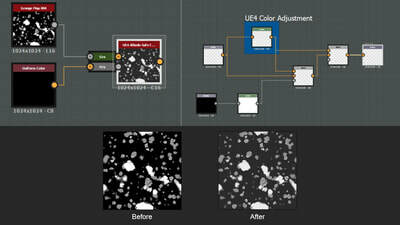 This method allows baked bounce light to be more accurate for local, reflected ground light/color. • Physically-based camera exposure can be controlled by the EV100 editor overrides, which is located in the viewport's Lit menu. If you choose to use it, uncheck the Game Settings first. You can apply EV100 Guide data to EV100 editor override values. 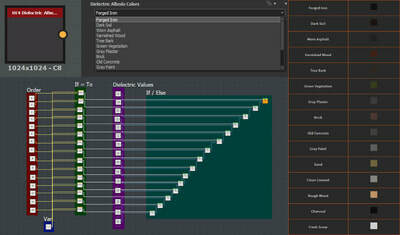 For additional control over physical camera attributes, you can use the Post Process Volume’s camera parameters. (Post Process Volume > Lens > Exposure > Metering Mode: Manual – the Camera options then become active.) It’s advised to leave the tonemapper alone unless you're trying to mimic a specific film stock. Further, you can apply Sunny 16 Rule Guide data to the Manual metering mode. Below are physical camera properties and their descriptions. Controls the amount of light that enters the camera via its opening size, as well as depth of field. T​he length of time film is exposed to light, which also determines motion blur amounts. The camera sensor's sensitivity to light. • Auto-exposure targets an average scene luminance equal to the Constant Calibration value, and it's histogram-based. Since there are different versions of eye adaptation, the following information covers a few of these options. In the Post Process Volume, you can enable the Metering Mode to Auto Exposure Basic (Post Process Volume > Lens > Exposure > Metering Mode: Auto Exposure Basic) and still use UE4's PBR lighting system. For scenes that contain much higher luminance ranges, it’s recommended to switch to Min/Max EV100 settings (Edit > Project Settings > Rendering > Default Settings > Extend default luminance range in Auto Exposure settings) for proper auto-adjustments. (Min/Max EV100 replaces the Min/Max Brightness options in the Post Process Volume.) You can apply EV100 Guide data to Min/Max EV100 values. Below are common exposure properties these two methods share. Adds stops (2^ExpComp) onto the set exposure. ​The clamped range the camera auto-adjusts within. By default, it uses cd/m², unless Min/Max EV100 is enabled. Targets an average scene luminance (18%-albedo) and is used for white balancing. ​Note: When Min Brightness = Max Brightness, auto-exposure is disabled. By increasing or decreasing the exposure by 1-stop, the brightness will either be doubled or halved. Moreover, sunny scenes typically work better with larger exposure ranges, while cloudy environments use smaller ones due to more evenly diffuse lighting. 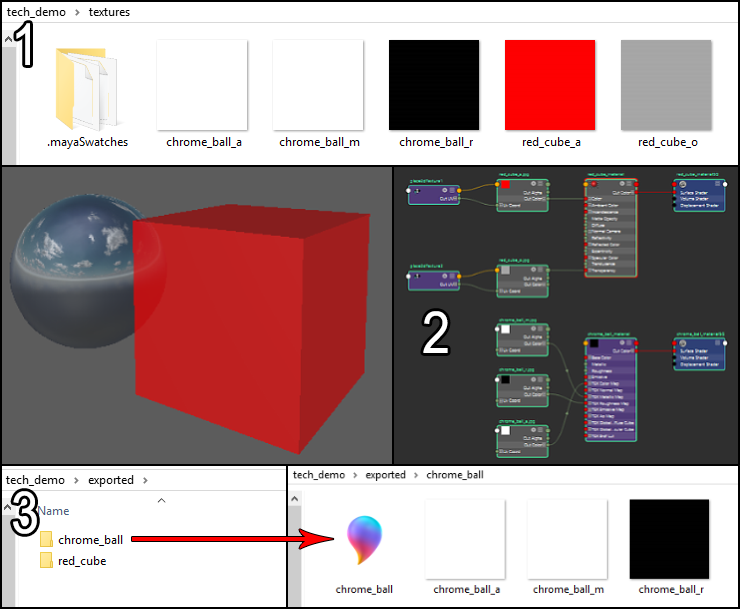 Note: If Pre-exposure (Project Setting > Engine > Rendering > Apply Pre-exposure before writing to the scene color) is enabled, previous frame scene exposure is applied to the shaders. This is beneficial for bright lights and increased Auto Exposure Basic quality. Note: The Pixel Inspector can analyze pre-exposure values. 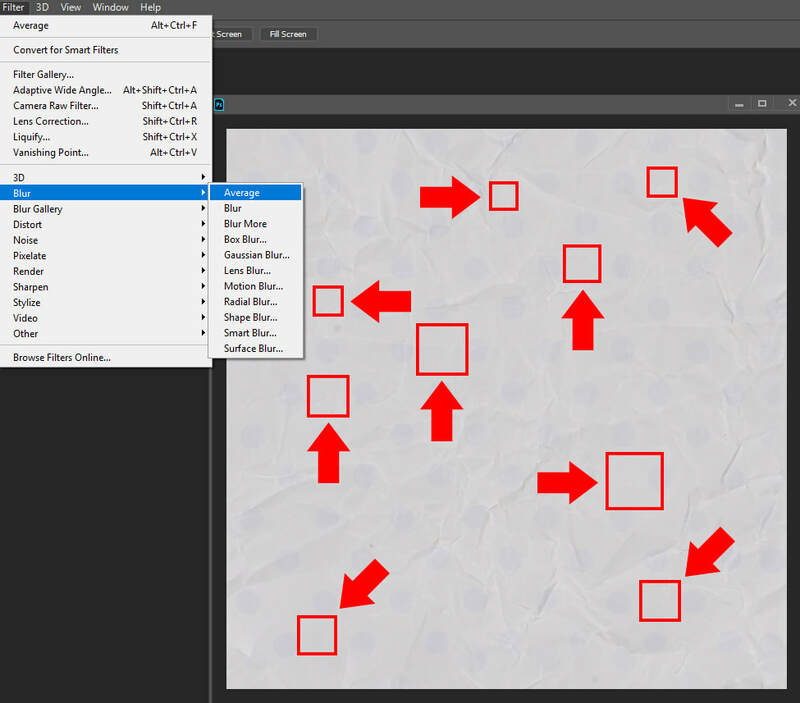 • Since light calculations occur in linear color space, it’s advised to sometimes view sRGB albedo textures in this format to better understand how base colors impact lighting. (Typically, linear values are darker than sRGB ones.) 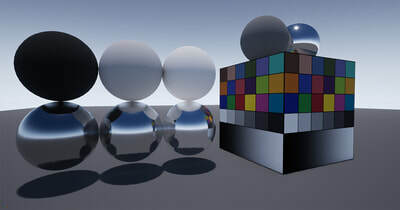 For example, linear albedo values that appear too dark may not bounce enough light due to its high-absorption properties, thus potentially flattening baked lighting results. Inversely, linear albedo values that are very bright may reflect too much indirect light, creating a scene that could be hard to balance. (Most dielectric albedo colors exist in the sRGB midtones, while a majority of metallic albedo colors reside in the 218-255 sRGB range.) Finally, albedo values that are too saturated may scatter overly-colored bounce light, rendering a potentially undesirable look. You can visit the Albedo Luminance Range section for more information on suggested PBR base color value ranges. Below are other material properties to consider regarding light interactivity. High-absorption or reflectance and low-scattering. 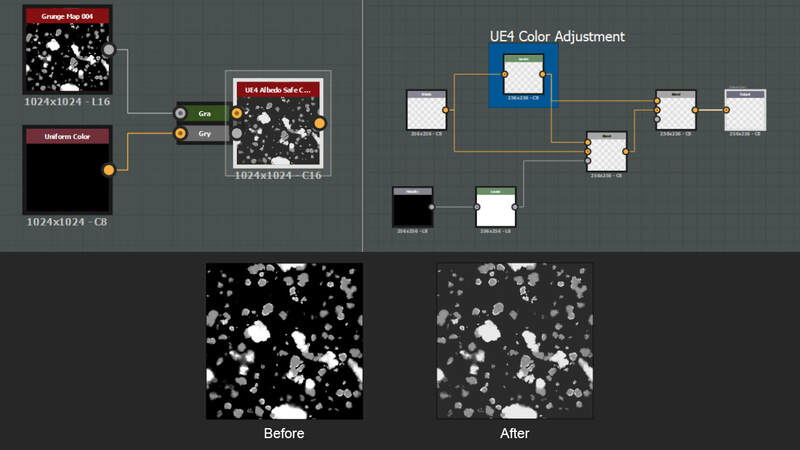 Note: UE4 uses the ACES Filmic Tonemapper to help map HDR values and wide color gamuts to LDR displays, and to future-proof content. While using the tone mapping function, visuals obtain higher-quality and more realistic results. For instance, as colors become more desaturated the brighter it gets, there's a reduction of flattened highlights, a greater use of contrast range, and shading/color is better preserved. (For comparative purposes, you can enable/disable the ACES Tonemapper by going to the Viewport > Show > Post Processing > Tonemapper.) 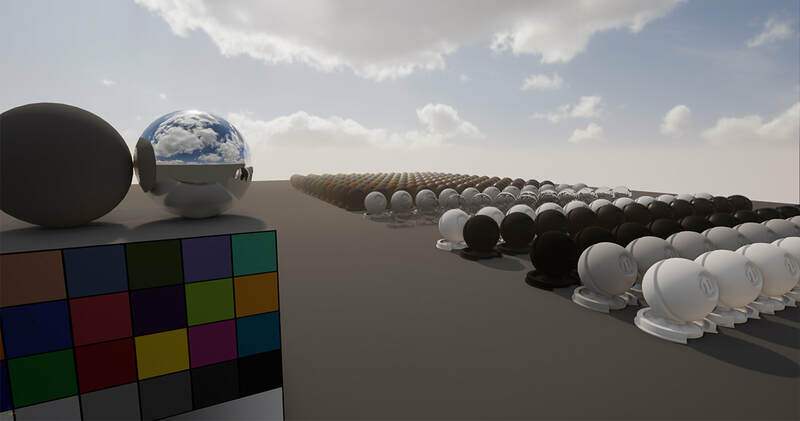 In addition, the Rec.709 color profile is UE4’s default viewing space for LDR displays so that it can match broadcast standards used by console games. 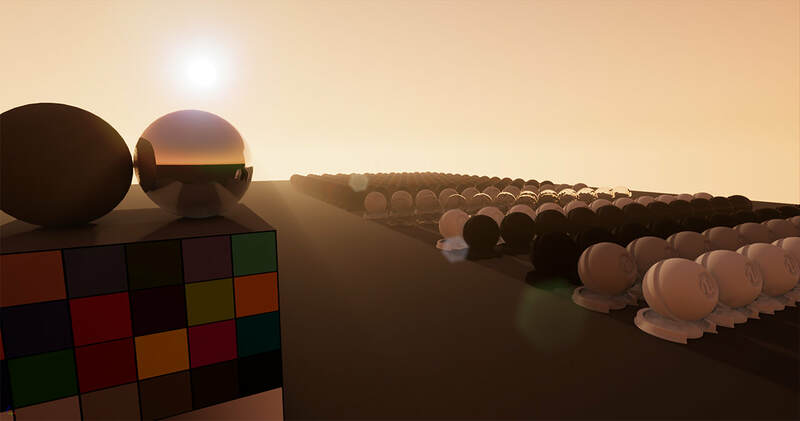 To confirm the accuracy of UE4’s PBR lighting system without adjusting the Sky Light’s Intensity parameter, I created a simple scene to evaluate it with the Pixel Inspector. This test uses physical values of matted, white paper and real-world data for sun/sky intensities. You can click on the gallery images below to learn more about this process. ​Cubemap panels need to be arranged in a specific manner for correct orientation in UE4. The chart below represents these panels in a horizontal strip format, ordered from left to right, as you go down the list. 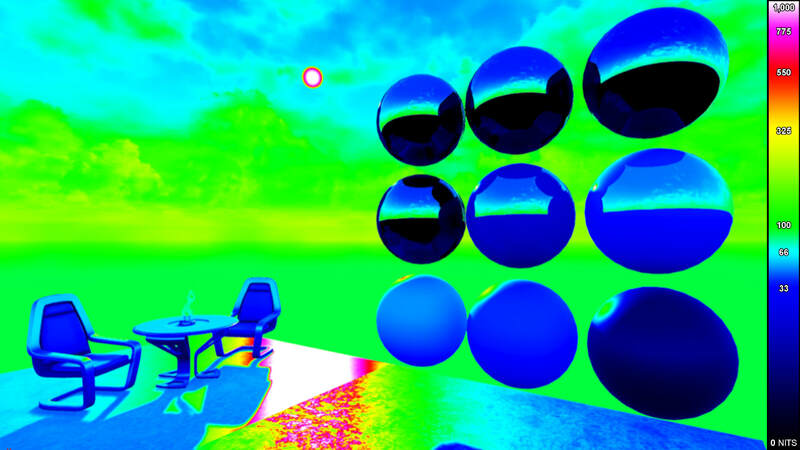 Note: Alternatively, you can import a 32-bit OpenEXR sky texture with an equirectangular, 2:1 aspect ratio, use it within a material, assign it to a sphere covering the whole background, and then capture the results in a cubemap via the Sky Light. 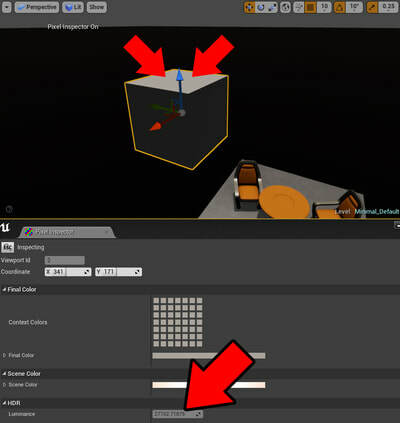 Techniques for skybox setup can be found in The Matted, White Paper Test section. ​It’s important that textures are interpreted in the correct color space, so below is a guide to help with this process. Base colors with no lighting/spec/shading data. Most albedo values exist in the midtones. Baked, high-res surface detail with vector directionality data for direct light interaction. ​Determines if a material is a metal, dielectric, or a mix. ​Controls scattered light passing through a surface. Note: Channel packing multiple grayscale maps into one texture can save on memory cost. 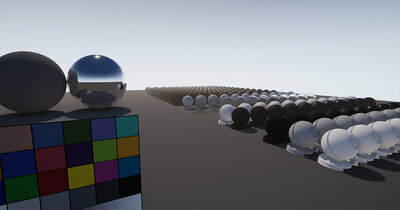 ​UE4 supports the metallic/roughness PBR workflow. Some of the values listed below work best in UE4 and may not be suited for other applications. 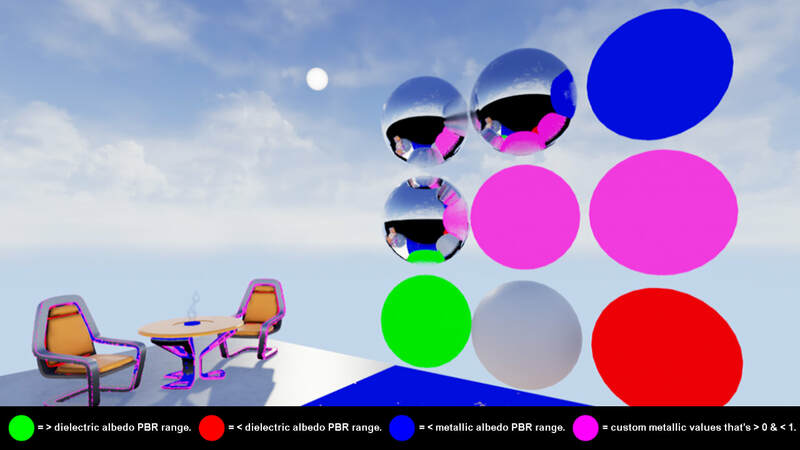 Further, UE4's environment and color picker live in linear color space, but artists typically work in sRGB. In effect, the following values are in sRGB first with corresponding sRGB color swatches. Dielectric albedo values control reflected color and most exist in the midtone range. Charcoal is the darkest dielectric albedo value that should be used. Insulators don't typically have colored specular reflectivity, but lights affect reflected color. Dielectric albedo values control reflected color and most exist in the midtone range. Fresh snow is the brightest dielectric albedo value that should be used. Insulators don't typically have colored specular reflectivity, but lights affect reflected color. 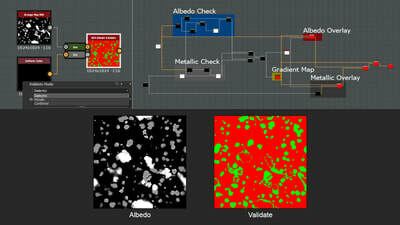 Unlike dielectric base colors, metallic albedo brightness controls specular intensity, which can contain color. Conductive albedo values fall within this row’s range. On average, most dielectrics have a F0 value of 4% reflectivity and do not require a metallic map. If they are part of an asset that needs one, the non-metal portions should be black. Further, metallic map properties should represent the top layer of the material, like painted metal, which would not be metallic in this case. This map determines whether the albedo map is treated as reflected color or metallic reflectance values. Most metals have a value of 1, and the metallic map is multiplied against the base color texture. You can have gradient transitions between insulators and conductors. Exceptions, like metalloids, may use values that are neither 0 or 1. The images below display ​increasing dielectric-to-conductor metallic properties. Note: Roughness and normal maps are used to describe micro/macro surface detail. 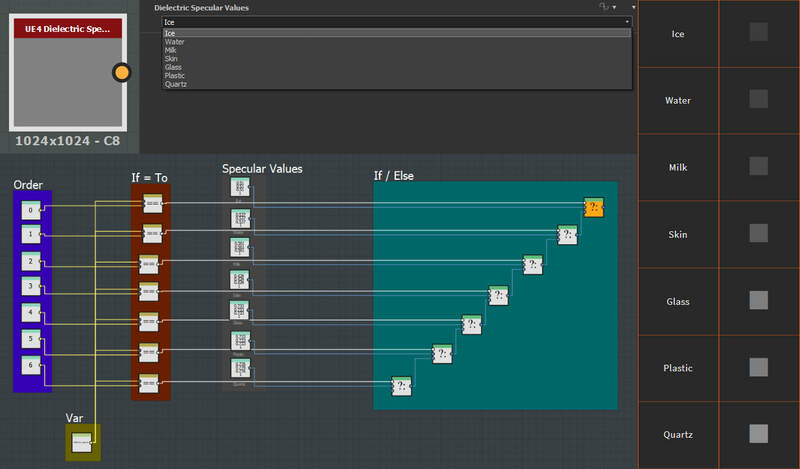 UE4’s specularity has a default value of 0.5, or 4% reflectance, to represent common dielectrics. (Metals are not affected by this property since their albedo maps control specular strength.) However, more unique materials, like semiconductors and gemstones, can be higher. Since all surfaces have some level of specular reflectivity, this property should never be set to 0. You can connect cavity maps to it, but they should first be multiplied against the default 0.5 value. This is for consistency with UE4’s average dielectric F0 reflectance value, while removing specularity in baked, micro-occluded areas. 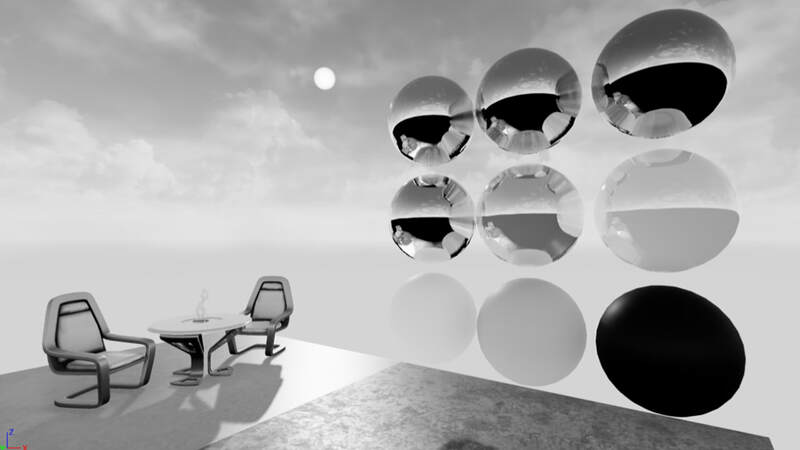 ​UE4 remaps the normalized 0 - 1 range to 0 - 0.08 for specular input. This means UE4’s specular component can have a maximum of 8% for its dielectric F0 reflectance value. (F0 is the reflected light intensity at 0° to the view frustum. The “F” component is Fresnel, which describes varying reflected light strength based on viewing angle.) 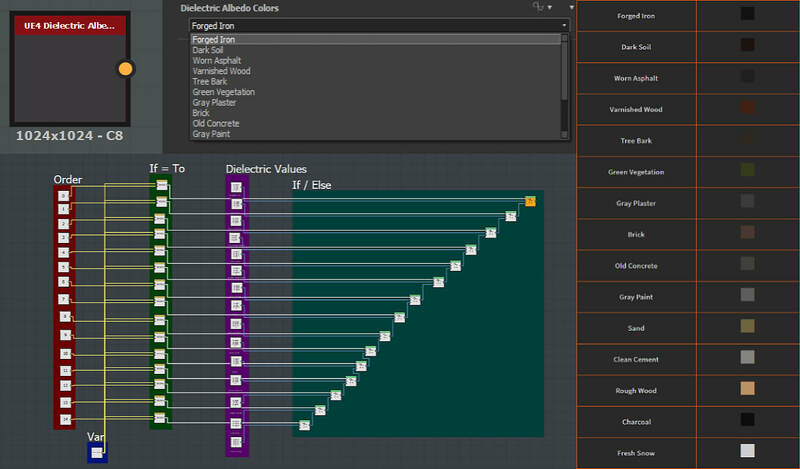 The formulas below calculate the dielectric F0 reflectance value from IOR, followed by applying a conversion for UE4 specular reflectivity use. The images below display increasing specular properties. Index of Refraction, or IOR, describes how much light bends through medium to another. The values below are based on real-world, optical measurements. The images below display increasing index of refraction properties. Clear Coat simulates multilayered materials with dual normal/roughness parameters for a transparent film layer effect on top of dielectric/metallic surfaces. Examples of this kind of material include lacquer, films over car paint/soda cans, and carbon fiber. To use it in UE4, it first needs to be enabled within the Project Settings, followed by changing a material’s Shading Model to Clear Coat. The chart below covers some Clear Coat material properties. Clear Coat layer roughness attribute. Clear Coat layer normal attribute. Bottom layer normal attribute. This node needs to be added, with a normal map connected to it, for dual-normal/multidirectional direct light interaction. The images below display increasing Clear Coat properties. Neutral gray can be used for texturing. 18%-gray can be used for lighting tests.